The Information Centre regularly organizes educational seminars for teachers and students at secondary schools and universities. Reflecting current events, there are also thematic seminars on selected issues organized in the Information Centre. Teachers of civics, social studies, history and other social sciences are given an opportunity to participate in an all-day seminar called “Czech Parliament and Parliamentarism”. In addition to teachers, a similarly designed seminar is also aimed at higher-grade students of secondary and higher specialized schools interested in social and political affairs, who wish to become familiar with the activities of the Czech Parliament. 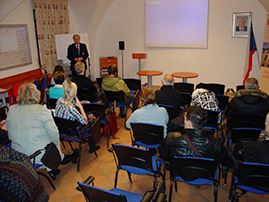 A seminar called “A History of Modern Parliamentarism in Czech Lands”, designed particularly for teachers of historical and social sciences, gives a detailed view of the transformation in the forms and functions of representative bodies, with an emphasis on modern Czech history.